Dr Ajit Menon is a top cardiologist who is well experienced in coronary angiographies, complex coronary interventions, use of rotablator and other devices. 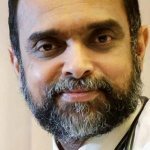 Dr Ajit MEnon has been Involved in over 12000 intervention procedures. Dr Ajit Menon is well experienced in use of implantations of Permanent Pacemaker, AICD and Biventricular Pacemaker. -Awarded Distinction in Forensic Medicine & Toxicology at the 2nd MBBS Examination held by the University of Bombay. -Ranked First in the College at the M.D. Examinations held in Jan 1989. -Ranked First in the University of Bombay in the DM Cardiology Examinations held in Oct 1991. -Passed MBBS in 1984 from LTM Medical College & General Hospital, Sion, University of Bombay. -Completed MD (Internal Medicine) in 1989from LTM Medical College & General Hospital, Sion, University of Bombay. -Completed DM (Cardiology) in 1991from Grant Medical College & Sir J.J. Group of Hospitals, University of Bombay.